I can’t believe it’s been almost a year since I posted anything new. In my last update, I was dealing with my first wedding shoot, a spur-of-the-moment project that I was happy to do, but which totally stressed me out. The actually shooting wasn’t that bad, but when I started processing the photos, I wasn’t pleased with how the images were turning out when printed. The difference between the way they looked on my monitor and the way they printed was so drastic that it just about killed my enthusiasm for the project. It was probably time to step away from photography for a bit, at least the more technical aspects of it. In the meantime, I’ve enjoyed just taking shots with my iPhone for the pure enjoyment of capturing everyday life, humor and tragedy included. Instagram has been a fun way to share those spontaneous shots without worrying about getting the perfect white balance or the rule of thirds. It’s been a catharsis of sorts. But recently I’ve begun to miss my dSLR’s, and when we planned a quick weekend trip to Houston to visit old friends, I decided it was time to take the cameras out for a spin. It helped that we were driving instead of flying to Houston, so I didn’t have to worry about dragging all my equipment through airport security. I was able to take both cameras (D700 and D5000), all the lenses I wanted, as well as my tripod. And I’m really glad I did! The weather was gorgeous while we were there, so I spent several hours shooting both single images as well as brackets for HDR processing. And it was nice to have a good camera on hand to get a shot of all our friends at our little reunion dinner. So, without further ado, here’s the first shot that I processed from my recent foray back into the photography waters. 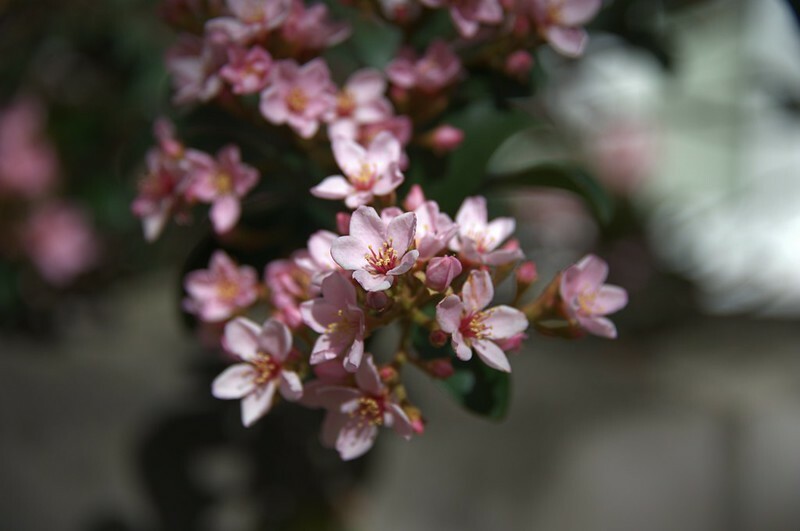 This was a quick shot that I took of some flowers blooming along the sidewalk as we strolled through the Medical Center area. I used the Nikon D700 with the 28-300 lens, and I processed the shot in my old stand-by, Paintshop Photo Pro X5. I’m in the process of working on more of the images that I shot on our trip, and I’m excited about getting back into the groove of things. Springtime is coming (sooner or later! ), and it will be the perfect time to brush up on my skills. This entry was posted in Shooting and tagged 28-300mm, D700, flower, Houston, Nikon, Texas. Bookmark the permalink. love this photo….glad to see that you are back….